A&W has been serving up root beer and burgers for nearly 100 years—grab a frosty mug and see how this California chain kicked off a new era of American eateries. 1. A&W IS NAMED AFTER ITS FOUNDERS, ALLEN AND WRIGHT. Roy Allen (the "A") jump-started the A&W chain in 1919, taking advantage of crowds attending a veterans’ parade in Lodi, Calif. The traveling entrepreneur, originally from Illinois, looked to capitalize on a root beer recipe he bought from an Arizona pharmacist years before. On a warm June day, Allen hawked mugs of his nameless root beer at five cents per cup, and realized the drink was a hit. Allen partnered with Frank Wright (the "W"), and the pair quickly opened root beer drink-stops in nearby California cities before venturing east. The business duo were partners for only five years before Wright was bought out and left A&W, but even after his departure, the name stuck. Allen went on to create the A&W franchise, adding food options to the root beer hotspots. 2. A&W SUPPOSEDLY OFFERED DRIVE-INS BEFORE ANYONE ELSE. Roy Allen allegedly created the first drive-ins for his A&W restaurants in 1921, just two years after his first root beer stand. The second A&W restaurant in Sacramento offered so called "tray-boys" who delivered burgers and root beer to visitors who ate from the comfort of their cars. Whether A&W truly coined in-car food is contested through fast-food history. Another California restaurant, the Pig Stand Number 21, is said to have had the first drive-thru window, created 10 years later, and another Cali chain, In-N-Out Burger, was the first to add a two-way speaker to their drive-thru in 1948. A&W also claims to be the world’s first franchise and the inventor of the bacon cheeseburger. 3. THE GREAT DEPRESSION AND WORLD WAR II WEREN'T THAT HARD ON A&W. A&W didn’t slow down after Wright’s departure, and economic downturn didn’t stop it either. Despite the Great Depression, the chain continued to add root beer stands in quick succession. By the time the U.S. entered World War II, Allen had opened 260 A&W locations. Rationing of sugar and meat during the war did temporarily stifle expansion, but by 1950, the chain expanded to 500 restaurants and into Canada. With more traveling families on the road after World War II, Allen’s success boomed to nearly 2000 A&W franchise locations by the 1960s. 4. A&WS IN CANADA ARE TECHNICALLY DIFFERENT RESTAURANTS. If you dine above the northern border, you’ll find that A&Ws in Canada are pretty similar, just with a few alterations. While the chain opened its first Canadian restaurant in 1956, the link between the American and Canadian locations lasted less than 20 years. By 1972, the chain of Canadian restaurants was sold to Unilever (yes, the same company that makes soap, laundry detergent and tea, among other things). 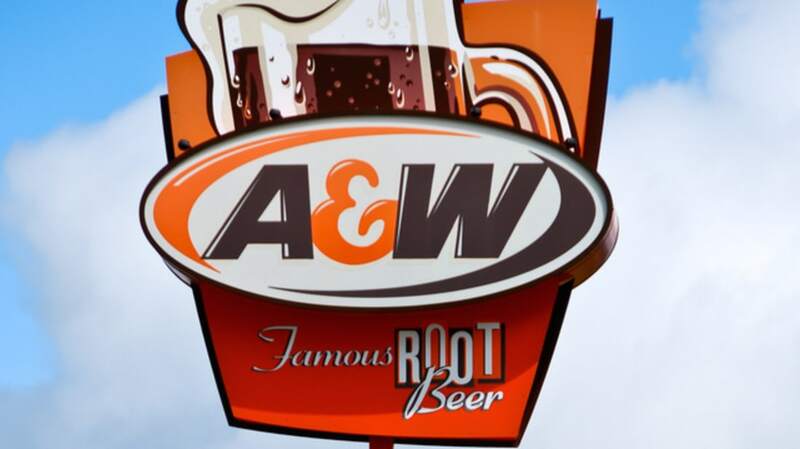 Both A&W chains offer root beer and hot foods, and have similar logos, though in Canada, A&Ws don’t serve up the tagline “All American Foods,” because that just wouldn’t make sense. Instead, the northern chain is focused on hormone and steroid-free meat products, which caused a huge beef with Canadian beef producers. 5. A CANADIAN A&W ONCE HAD A FLOAT-THRU. While the U.S. and Canadian chain generally offer the same foods, A&Ws up north sometimes take marketing to a new level. Take for instance the world’s first Float-Thru, where swimmers and floaters on the Okanagan River unexpectedly got free burgers as part of an A&W commercial. 6. FREE ROOT BEER IS THE BEST ROOT BEER. If there’s any day to find your closest A&W, it’s probably August 6. The chain celebrates National Root Beer Float Day with free mini floats. A&W restaurants also use the holiday to collect donations for selected charities. Unfortunately, there’s no big deal for National Burger Day. 7. EACH FAMILY MEMBER ONCE HAD THEIR OWN BURGER. Ever wondered why A&W has the Papa Burger? It’s because there used to be a line of burgers named for every member of the family: Mama, Teen and Baby, too. Each came with its own toppings and sauces named for the burger (like Papa Sauce and Teen Sauce, which sound just a little strange), and varied in size, with Papa as the largest and Baby offered to kids. The Burger Family became a marketing tactic throughout the 1960s, and A&W invested in roadside statutes of all four family members, complete with burgers and frosted mugs of root beer. Like the statues, most of the Burger Family is gone for American A&W fans. But, Canadian A&Ws still offer the entire Burger Family, along with some new members, like the Grandpa and Uncle burgers. 8. ONE BURGER HAD A HORRIBLE NAME. A&W used to offer the Awful Awful burger. The jumbo burger really wasn’t anything unusual—stacked with two burger patties, bacon, lettuce, tomato, onion, mayo and pickles. But, considering most A&W burgers only had one patty, this was an awful lot of sandwich. In 1960, you could get the Awful Awful burger for $1.10 (which with inflation would now be about $8.85). 9. YOU COULDN'T GET ROOT BEER IN A BOTTLE UNTIL 1971. That’s because A&W only offered their standout beverage in frosted mugs within its restaurants. By the late '60s, widespread demand pushed A&W headquarters to look at distribution, and in 1971, the first cans and bottles of A&W Root Beer rolled into stores. Other sodas, like A&W Cream Soda, sugar-free and diet root beers didn’t hit shelves until the late 1980s. 10. ROOT BEER HAS A SHELF-LIFE, AND IT'S PROBABLY NOT AS LONG AS YOU THINK. If you’ve ever thought of stocking up on A&W soda, take note. Root beer’s freshness all depends on the container and sugar content. Glass bottles and cans of A&W root beer will get you the furthest with a “best by” date of 39 weeks after they leave the factory. The brand’s diet sodas and soft drinks that come in plastic bottles have a shelf-life of only 13 weeks. 11. THE MARRIOTT FAMILY OWNED AN A&W BEFORE LAUNCHING THEIR HOTEL CHAIN. J. Williard and Alice Marriott, the founders of Marriott Hotels, first ran an A&W root beer stand together in Washington, D.C. The couple opened the root beer spot in 1927, adding in chili, coffee and hot tamales, and called their restaurant Hot Shoppes. Within a year, the Marriotts opened two more restaurants and began exploring other monetizing options. During the late 1930s, Hot Shoppes’ meal became a standard food item for airplane passengers flying through Washington D.C., and in the 1950s, the Hot Shoppes restaurants began providing food to area hospitals, meanwhile buying other fast-food chains. The Hot Shoppes success helped support construction of the first Marriott Hotel in 1957. 12. A&W’S MAMMAL MASCOT IS A PRETTY GOOD PLAY ON WORDS. A&W’s mascot, Rooty the Great Root Bear, emerged from the restaurant’s marketing department in 1974. But, for the past four decades, he’s been occasionally sent back into hibernation as A&W considers other marketing campaigns. In 2013, A&W revived the pants-less, root beer-loving bear with his own YouTube show about leaving his den and returning to work at A&W. But this decades-old bear isn’t completely old school; Rooty is pretty active online and even has an app. Perhaps that’s what’s made A&W a century-long success—being able to change with the times while offering a little nostalgia.